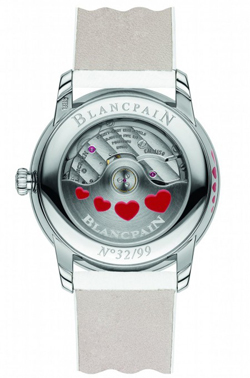 The dial designed by Blancpain for this special occasion, with hearts that circle, the plots of textures and combinations of forms, comes to life thanks to the expert work of highly experienced watchmakers and craftsmen manufacturing. The white mother of pearl and adorned with diamond indexes. Five hearts of red lacquered, inlaid in mother of pearl, introduce a splash of color and an additional note of brilliance. The stainless steel case with a diameter of 34 mm stands the bezel, accented with two rows of full cut diamonds (full cut) set. The case middle and decorated with up to 9 hours of five hearts of ceramic liquid. This technique requires that the liquid material is deposited with extreme caution before cooking, that the fixed once and for all. This charming model with three hands, wherein the counterweight of the second hand resumes the elegant symbol of Blancpain, houses the Caliber mechanical self-winding 1150, with a date and a power reserve of 100 hours, and allows in daily life to combine function and elegance. Even the rotor and decorated with hearts, and in the end they are 14. A leather ostrich white, seamless and lined with alzavel, conceals itself full of hearts and this watch was born under the sign of love. 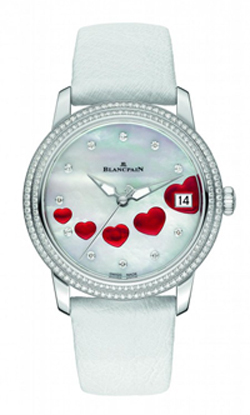 The model Valentine’s Day 2013, produced in a limited edition of 99 copies, and presented in a white wooden box on which are carved of white hearts that reflect the pattern of the dial.